It is a 10 minute drive from my home to Stop & Shop. My 13 monh old fell asleep on the ride there. I somehow how was able to get him out of his carseat and into the shopping cart without waking him up. He continued to sleep for the majority of my shopping trip. Sorry for the fuzzy picture, but it was too cute to not share. That is too cute!! 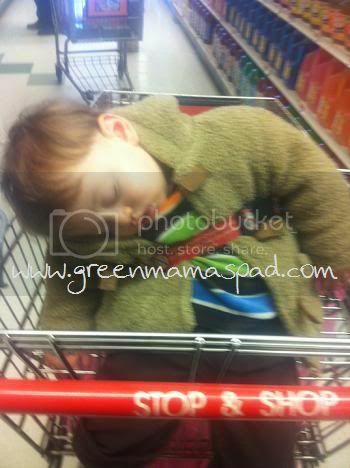 I had my son lay in my coat in the cart once he was just SO tired but I had to go shopping. Its just adorable! So cute! I bet everyone you passed in the isle had to comment hee, hee. Too cute. You gotta love when that happens lol. Oh, how funny! My daughter is one of those that can fall asleep anywhere also! I can't tell you how many pictures we have of her snoozing in the exersaucer! That is cute but doesn't look comfortable. LOL. So sweet. Don't you wish you could just take a nap when/whereever you want? Oh that's just so darn cute! I sure do miss those baby days! I really miss Stop & Shop since we left CT and moved to FL, it's a great grocery store. I used to work there and my hubs worked there for 45 years until he retired. LOL -- I *WISH* my kids would do that while at the store. But, no, they have to antagonize each other the. whole. time. Isn't it amazing how they can sleep through anything? Adorable! now that is too precious! I remember those days. Cute photo! Wow, I can't even move my daughter from the carseat to her crib, and you can get him into a grocery cart AND shop? Great job mama! My daughter is 5 and she can still do this ROFL!